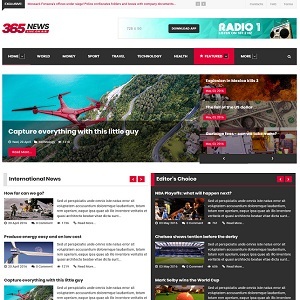 365News is a modern, news oriented Joomla template built on the powerful Gantry 5 Framework. It suits well for every news, magazine and blog site. 365News comes with many custom particles that bring the features that you need for news display, gallery showcase and article writing. 365News uses RokSprocket, SP News Show and "Slideshow (Joomla)" Particle which fetch Joomla articles automatically. 365News brings the full power of the Gantry 5 Framework! It is easy to impress your clients with 365News!